The Moving Average Convergence Divergence, often referred to as the MACD, is used to help investors quickly compare the two current moving averages related to a stock's price. For many investors, comparisons such as these act as the foundation for more detailed analysis while simultaneously offering a macro-scale overlay of critical information. Understanding how MACD stock information is gathered, evaluated and deployed can help investors across a broad array of experience levels make better investment decisions in the short and long term. The MACD formula is used to provide investors with a comparative assessment of two primary exponential moving averages. With this information, investors can compare MACD lines to current price levels, gaining a more comprehensive overview of market activity, which may signal upcoming market action. On a fundamental level, the MACD is calculated by taking the difference of the 26-period exponential moving average and the 12-period EMA. For those unfamiliar with the term EMA, this particular data point is a variation on the standard moving average, which increases the weight of more recent data relative to older reports. Much like the simple moving average, in which all data is treated with the same level of importance, the EMA is used by investors to predict the likelihood of specific price action in the near future. These predictions are derived from observable crosses and divergences that are occurring currently relative to historical data that has already been gathered. Knowing that the MACD formula is derived from a comparison of the 12- and 26-period (day) moving average, it is then possible to begin to use this information as a forecasting mechanism. When the 26-period EMA is subtracted from the 12-period EMA in order to calculate the MACD, the resulting figure can provide an extensive amount of forecasting information for analysts. The data that is created as a result of comparing the 12- and 26-period EMAs is plotted on its own specific line, often referred to as the MACD line. Once this line has been created, a nine-day EMA of the MACD is typically superimposed on top of the MACD line in order to begin analysis. When a security's MACD line crosses above the signal line created for it, investors commonly interpret this as a sign that it is an optimal time to purchase the stock in question. Similarly, when the MACD line dips below the signal line created for it, investors and analysts consider this a strong indicator that it is time to sell the stock in question. This type of analysis relies on what are commonly referred to as "technical indicators." A technical indicator is commonly defined as any mathematical calculation that is derived from the price of a current security or contract, as well as its volume or open interest. 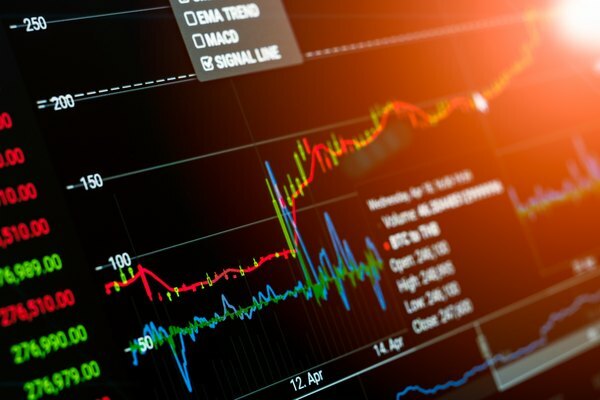 Although the MACD is often used and a highly effective indicator that is reinforced by extensive numerical analysis, there are also a variety of other technical indicators that also find their way into the toolkit of modern investors. At the heart of the MACD analysis is the concept of divergence. In situations where the MACD line reaches highs or lows that do not correspond to those currently displayed in the price, this is referred to as a divergence. Investors may identify this type of divergence as a bullish divergence, where the MACD line forms rising lows that are matched to falling lows in price. Similarly, a bearish divergence may occur when the MACD line creates a falling high that corresponds with a rising high in price. In either situation, enough of a divergence has been created to signal the potential for market action. In situations where the MACD line is rapidly rising and falling, this type of activity is interpreted as an overbought or oversold situation where price action will likely return to normal levels in the immediate future. These situations are typically explored in conjunction with a Relative Strength Indicator in order to determine what, if any, action should be taken on the part of traders. Analysts deploying the MACD line have noted that this particular methodology is not entirely error-proof when attempting to predict market actions. At times, the MACD can predict a forthcoming price swing that never actually occurs. Investors often refer to this particular situation as a "false positive." Similarly, situations also occur in which price action occurs that is not at all forecasted by the MACD. Analysts have pinpointed a number of reasons why such discrepancies could occur within the MACD analysis. One of the most common explanations as to why MACD "false positives" could occur is extended periods of horizontal price movement. Situations such as this serve to skew the MACD line and draw it toward the zero line irrespective of whether or not any actual divergence is occurring. Another common technical indicator, the RSI, provides insight into future market activity under the guise of determining whether a given security is currently overbought or oversold. Although both the MACD and RSI are commonly used in conjunction with one another to provide thorough market analysis, their methods of evaluating the market are distinct from one another. Whereas the MACD acts as a comparative analysis tool, exploring the relationship between the EMAs mentioned previously, the RSI acts as an oscillator, calculating all of the average price gains and losses over a specific time period, the most common being 14 days. Although both the MACD and RSI rely on different methods of data analysis, they are, in effect, tools that carefully assess market momentum. Certain warnings must be given, however, when it comes to relying on multiple indicators to assess market activity. In some situations, data collected via the RSI may point to a contrary market action from that which has been derived from the MACD. With that in mind, investors and analysts should carefully determine which particular analysis tool is most closely suited to their current needs. As with any new technique or skill, it is highly recommended that investors practice MACD analysis at length before committing to any application with real trades. Given the uncertainty that remains prevalent in the formula regardless of its data-driven approach to analysis, there remains an element of risk that will certainly factor into trades over the long and short term. With these ideas in mind, personal investors should carefully assess their own readiness using technical indicators such as MACD and invest conservatively while coming to terms with the complexity of this methodology.